Memorial Day, like Thanksgiving, is one of those holidays that I never really “got” until I was an adult. As a kid, I was fine with the day off from school, a few flags in the neighborhood, and a tasty barbecue, but really, there were no fireworks, no gifts, no parades to speak of, so it wasn’t anything special. As an adult, it has become one of my favorite holidays, partially because it truly signifies the start of summer. As a stay-at-home-Mom, with no end of the school year to trigger the “summer” vibe, I like that Memorial Day weekend marks the start. We usually swim for the first time, eat watermelon, spend time outside in the heat (though this year it rained all three days), and, of course, it’s the first day of the year that I make homemade ice cream. For me, ice cream is one of life’s greatest pleasures. Having spent two of the last three summers extremely pregnant, I acquired a whole new love for frozen desserts, and I felt like I was making homemade ice cream all the time. I’ve made several vanilla ice cream recipes, and this one is undoubtedly the easiest, but it’s weirdly also the best. During my second pregnancy in a bizarre nesting/hot/hungry rage I made several varieties in one day and hosted a blind tasting to determine the best – and Philadelphia style (no eggs) won out unanimously. One way to make this easier is to purchase vanilla bean paste instead of vanilla beans. I started using the paste many years ago and I haven’t purchased a single vanilla bean since. The paste gives the correct look, taste, and consistency without the trouble (and expense!) of real vanilla beans. The bottle may seem expensive, but it will last for a long time. Pair this with some homemade chocolate sauce, a handful of strawberries, and some toasted pecans and it’s basically heaven. This recipe makes the perfect amount for my 1.5 quart Cuisinart ice cream maker and serves about 6. 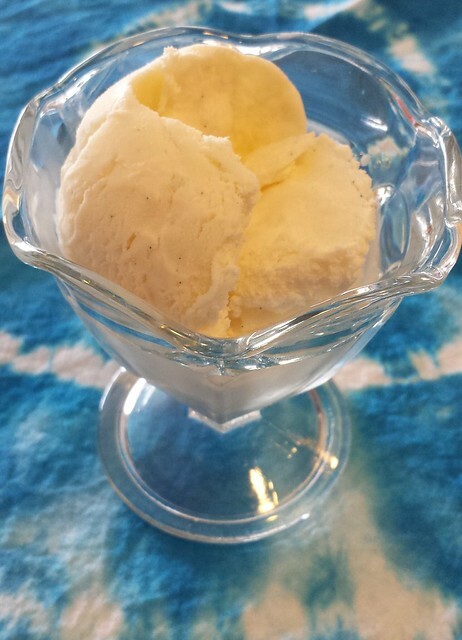 I purchased a second bowl for my ice cream maker a few years ago so I make 2 batches for a crowd. As with all homemade ice cream, getting the ice cream to harden is difficult, so making it the night before so it can benefit from a night in the freezer gives it a great consistency if you aren’t into soft-serve. 1. Pour the sugar, 1 cup of the cream, the salt, and vanilla bean paste into a saucepan and cook over medium heat until the sugar has dissolved (don’t bring it to a boil, it doesn’t need to be that hot). 2. Pour the mixture into a large bowl and stir in the milk, the second cup of cream, and the vanilla extract until combined. Place the bowl in the freezer or refrigerator for at least 30 minutes to chill. 3. Make the ice cream according to directions on your ice cream machine. Mine usually takes 20 minutes or so and makes a soft-serve consistency. Transfer to a container and move it to the freezer to harden before serving. How long can this be left in the freezer before it must be used? I’d try to eat it within a few days – since there are no preservatives it starts to freezer burn pretty fast. That said – it usually doesn’t last long in my house :).